Do you know that YouTube is the world’s second largest search engine after Google? With over 60 hours of video being added every minute and crossing 800 million visitors every month, YouTube is the largest video sharing website in the world. What better way to promote your business than YouTube! But grabbing eyeballs to your videos needs a proper strategy to drive traffic and generate revenue. Hence it is imperative for any business entity to handsomely invest time and money in optimizing videos to reap the benefits. In this post we’ll discuss some of the best practices in YouTube optimization that will help you in generating organic traffic to your channel. People need information. They need it in a way that is simple to understand and easy to interpret. Before you start creating content, do a proper research on potential topics which your customers will be interested in. To put it simply, great content coupled with consumer interest is what drives visitors and differentiates you from the crowd. Approach the video as an audience. They need informative and engaging content. You should create content that is unique, solves a problem, adds value and meets the viewer needs. If your video content is poor, the viewers won’t Like/comment on the page. This will trigger bad signals to Google and your video will be penalized in the Search Engine Result Pages(SERP). The better the content is, more likely popular websites will share it. A viral video is more likely to be featured on top of the results than a low traffic video. Hence the Virality factor majorly depends on how much value your video provides. You need catchy lines to grab people’s attention. Create a title that targets your keyword and prompts the user to click instantly. Carefully researched Keyword insertion in the meta tags is the most important factor in YouTube rankings. Title should be just enough to tell people what the video is about while creating a curiosity about the content. The best way to improve ranks is by using multiple keyword phrases wrapped into a single long-tailed phrase. 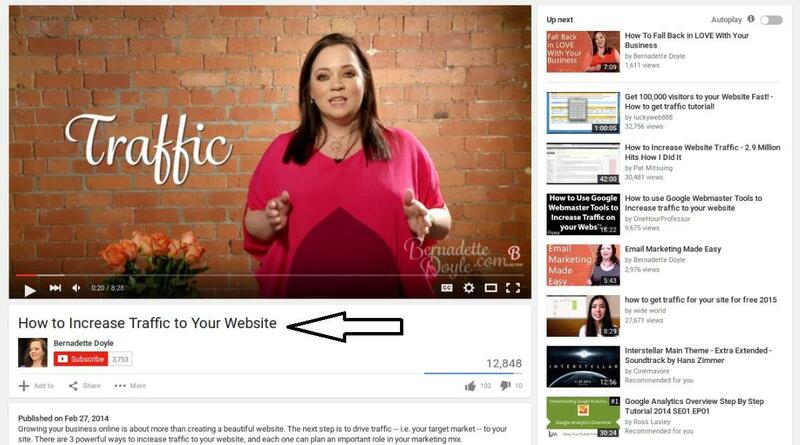 One example of a video title can be “How To Increase Traffic to Your Website“. Following is an example of a good title. Ideally the title should have 120 characters. Always place the keyword in the beginning. It will increase the relevance of the text during a search. Title should be as natural as possible and keyword stuffing should be avoided. Change the file name of the video mentioning the primary keyword. It is important that you need to have a clear and concise description of the video content. Remember that YouTube bots cannot watch the video. Hence the content that you use to describe should be spot on. Another way to rank is by placing the transcript of the video in the description. This is particularly useful if you are discussing a confusing topic. People generally go back to the description after watching the video. By placing the transcripts, you can target the keywords efficiently and can provide additional context about the video content. Playlist feature allows you to classify videos in your channel based on the topic of your choice. While grouping videos of similar topic, choose a keyword focussed title and provide a carefully crafted description. They are particularly useful because they help facilitate more views by specifying the subject matter to YouTube’s search algorithm. TED channel grouped its best talks into a playlist. Further the playlist bar plays an entire playlist automatically once the user starts watching your video. This provides an additional opportunity to expose your content list to your prospective customer. 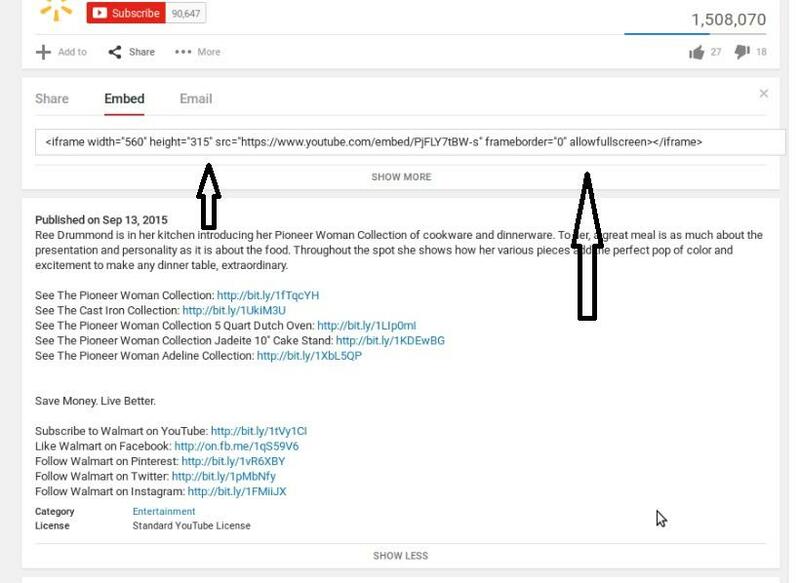 You need to have a strong call-to-action within YouTube annotations and video description. Annotations, if used correctly, can increase viewership and drive traffic to your other videos. Annotations should be placed in an unobtrusive part of the video, on the borders to be precise. 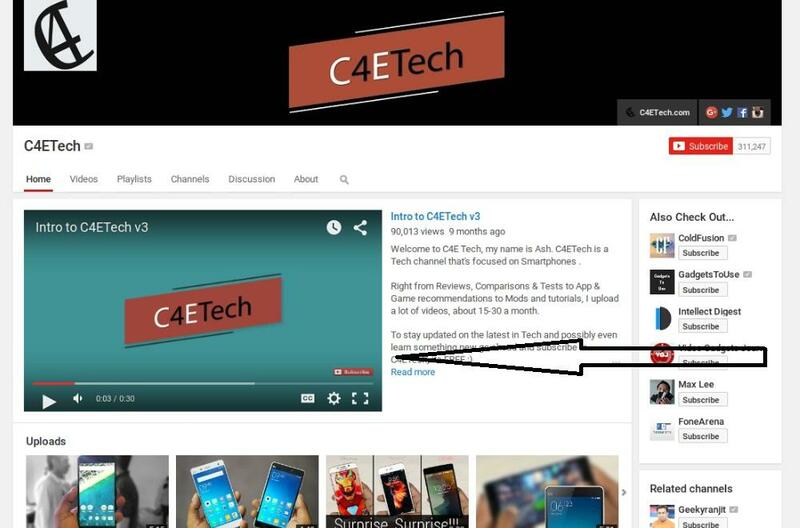 In every video, you can add annotations of your other videos and ask the viewers to watch them. At the end of every video, constantly remind the viewers to subscribe to the channel and share the video on social media. Brand engagement is important! YouTube’s channel trailer is another example of a strong call-to-action. 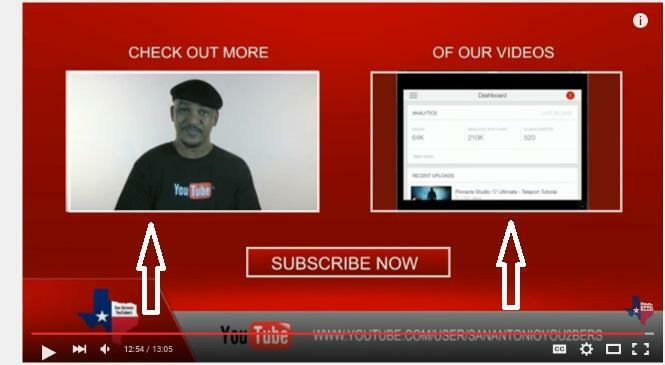 When an unsubscribed user lands in the channel’s homepage, the trailer gives a brief exposure about the channel and the content. A well made trailer can influence the visitors to subscribe and check out your content. Tags are a way of telling YouTube what the video is about. They help in ranking your video Start with the top keywords targeting your video. You need to target the keyword phrases with good search volume and low competition. Ideally long tailed keywords are the best for video tagging. One way of finding the best tags can be typing the primary keyword phrase in Google and moving to the bottom part of the SERP. You’ll find the relevant keyword tags under “Searches related to (your keyword phrase)” section. Choose the phrases that are most relevant to your video and paste them as tags. Put in atleast 8-10 relevant tags so that when a search operation is performed, YouTube indexes your video for all the relevant phrases. Closed captions are the display text that appears on the screen providing additional information about the content. The term ‘closed’ means that viewers need to activate them to view the text. So why should you go for Closed Captions? Closed captions can help people with hearing impairments to see and understand the video content. 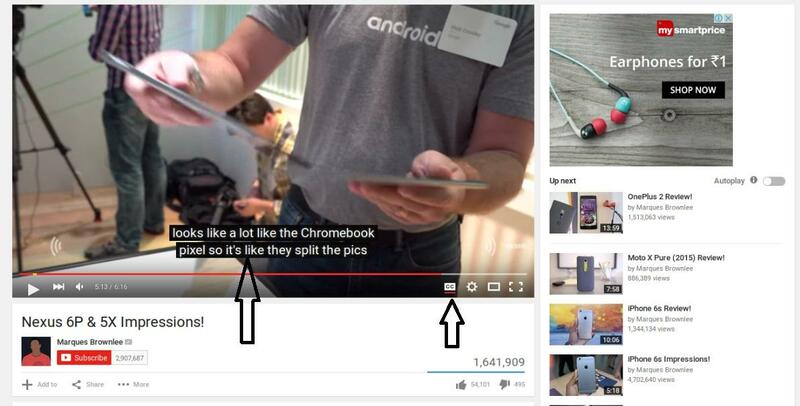 Unlike the visual content, captions can be indexed by Google, just like any other text. By including your keywords in them, you can rank high in search results. Captions come in handy when you don’t want to play the audio. You can look through the captions and understand the content. Videos with closed captions rank significantly higher since they allow access to information in multiple formats(languages) based on the viewer need. Following is a good example of a video with closed captions. If you’re producing a video rich in words, you should definitely consider including Closed Captions. Along with targeting primary keywords, it will also generate long-tailed organic traffic. Sitemaps is an important entity which provides a path for the bots to index the content. Similar to a website, it is necessary that your videos contain a sitemap. Submitting an XML sitemap will enable Google bots to crawl the website and rank better for a related search query. Video sitemap can be easily created using Sitemap generators and Google Webmaster tools. Learn more about creating video sitemaps by clicking here. Using schema.org is also a great way to optimize your videos. It is a semantic markup standard that all major search engines have incorporated in their search algorithms. This HTML markup provides additional information to the search engine bots describing the video content. Do I host my videos natively( in website) or on YouTube ? This is an often repeated question. We did quite a bit of research and here’s what we found. YouTube is a top property of Google and going by latest search algorithms, hosting your videos on YouTube will be beneficial for you in the long run. Embed code will allow you to place your videos on other platforms and the popularity of the video can be determined by the number of embeds. Embed code as shown above can be added in your website. Also it is also essential that the landing page contains enough text and rich media to complement the video. When a user has a strong landing page experience, Google algorithms gets good context about the quality of the site and improves the SERP rank. The goal of any online promotional activity is to drive traffic and increase revenue. With YouTube videos, there are enough avenues where you can place your business details. Place your website links in the channel description. This helps interested visitors to visit the website for getting more information. Also it is important to mention the links of social media pages such as Facebook, Twitter, LinkedIn, Pinterest etc. This provides an opportunity to drive users to your social media pages and increase the viewer interaction. Though these links are automatically “Not Followed” by YouTube, it provides an opportunity to create awareness about your business and online presence. Google analytics is a great tool to analyze and report about a website’s performance. Connecting your channel with Google analytics will open the pandora’s box of valuable information about the demographics of the viewers. Google analytics can track the key statistics of the viewer traffic including the geography, age, device type and hotspots of the video. Along with that you can track the audience behavior such as New visitors vs. Recurring visitors, bounce rate and frequency etc. With the demographic information, you can efficiently target your audience for YouTube promotions. You need to enter your Google Analytics ID into your YouTube account to start monitoring your traffic. Plethora of information obtained from the Google Analytics will provide insights into audience behavior and video metrics such as PlayPercentage and Finish Percentage. You can use them to analyze the performance of your channel. Write a brief description about your company and provide contact details in this section. Include all the relevant keywords with an emphasis on your company’s goals and services. Always brand your channel and include social media links to increase Likes, followers etc. Social media has become more important than ever. Whenever a video gets a lot of shares, it tells YouTube that the video is popular and engaging. Google’s search algorithm takes this viral factor into account while producing a search result. A viral video is ten times more likely to feature for a related search query. Promote the video on all the social media pages of your company. Use a different strategy for each medium. For Facebook, you can upload the video with a short crisp keyword rich description about the content. In your Twitter page you can create custom Hashtags relevant to the video content and encourage the followers to re-tweet with that hashtag. It has been found that LinkedIn is 277% more effective in lead generation than Facebook or Twitter. You can leverage LinkedIn by targeting a specific audience for each content you create. Studies indicate that on-page interaction is significantly higher while targeting people specifically. Prompt the viewers to share the video on all social media platforms and spread the word. Ask them to ‘Like ‘ the video and subscribe to the channel. Likes, comments and shares matter! Creating a brand from the scratch is a difficult job. It needs a constant push for high quality and engaging content. Luckily in today’s world, social media makes our job easier to promote brands. They say ‘Products are made in factories; Brands are made in hearts’. To capture people’s hearts, you need to capture their attention first. To achieve that you need to roll out top quality useful content and market it efficiently. In the channel thumbnail and cover picture, they have branded their channel in BLOCK letters. It commands authority. Social media mentions of your channel connects you with a wide audience and helps in getting quality backlinks. Push your channel out through all social media platforms. Promote in Facebook, Google+, Twitter and even in your signature. Create a compelling thumbnail for your channel. Use a watermark at the bottom of every video telling people to subscribe. Encourage people to like and comment on your video. Every video that is shared, provides exposure to your content and builds the brand image of the channel. YouTube ads are a great way to promote your content. Videos with no views need considerable promotion before it starts generating organic traffic. 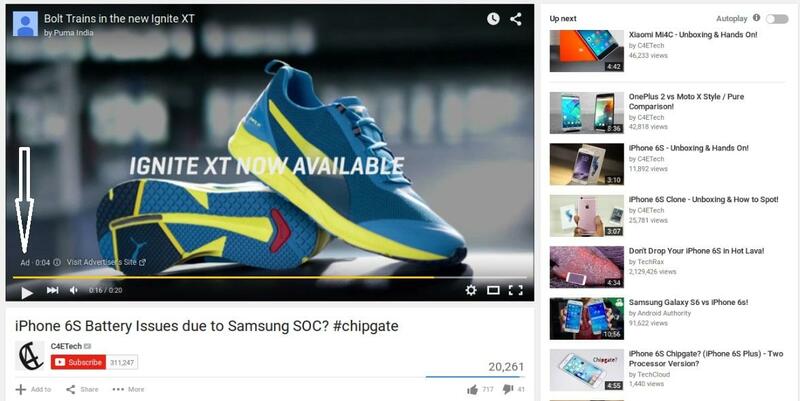 You can create a short ad that include links to your videos/channel and run it on popular channels. They work on a PPC (Pay-per-click) model, which means you pay only when someone clicks the link featured on your ad. Above is an ad that plays on a popular gadget review channel. You can choose to run your ads according to budget. Typical ads can be skipped after 5 seconds. If you need to run your full ad, you can opt for 20 second slot which is non-skippable. This will cost you higher and will provide visibility. Typically promoting the video till it reaches 100 visitors is a good strategy. Once it crosses this threshold level, your marketing strategies should come into play towards generating organic traffic and user interaction. Key there is to create a captivating advertisement of your product. Community engagement on a channel is really important since it builds relationships and provides feedback about your business. Suggestions and constructive criticisms should be considered. Thank the people who have watched your video and appreciated it. Don’t use a standard template. Personalize the messages. Don’t moderate the negative responses if they’re genuine. Apologize for the inconvenience and explain your viewpoint. Use private messages to reach out to the viewers for any serious concerns. Big brands engage and respond to consumers on social media to address their grievances. This sends a positive signal among the followers. Be polite while responding even when the comments are not. Always maintain your brand image. We’ve discussed some of the important tips and techniques to optimize your videos. Though it is almost impossible to predict if a video will go viral or not, following these strategies will definitely help you rank better in search results. We would love to hear your thoughts and suggestions about this blog post. If you have any questions or additional tips, please leave them in the comments section below.